Susan Hill’s novel I’m the King of the Castle is a meditation on the effects of having property, as seen from the perspective of two eleven-year-old children. Edmund is the son of Joseph Hooper, the owner of Warings, a large English country manor. Charles, on the other hand, is the son of Helena Kingshaw, a working-class maid whom Joseph hires to work at Warings. In spite of their young age, both Edmund and Charles are highly attuned to the differences between their families: Edmund knows he’s richer than Charles, and he never lets Charles forget it. By exploring the relationship between Edmund and Charles, Hill makes a nuanced distinction between property (the literal, material things that Edmund and his family own) and class (the more abstract sense of superiority that Edmund possesses, which gives him great power over Joseph). As a direct result of his family’s property, Edmund feels an overwhelming sense of power and entitlement. Because he’s richer than Charles, and “owns” Warings (in the sense that he’ll inherit it one day), he feels he has the license to boss Charles around and treat him however he wants. The first time Edmund ever meets Charles, he immediately feels superior to his working-class guest. It’s clear to Edmund that Warings is the source of his family’s power and that Charles is socially inferior to him because he “has nowhere.” Edmund mocks Charles for living in a flat (i.e., apartment) and being unable to afford tuition at boarding school, among other attributes that signal his family’s status as lower class. Edmund’s point is childish but brutally clear: he has more than Charles, and that makes him more powerful than Charles. Although the root of Edmund’s power over Charles is his family’s property, Edmund doesn’t seem to derive power from his property in any concrete way. For instance, there is never a point in the novel when Edmund threatens to kick Charles out of Warings—Edmund is just a kid, after all, and could never do such a thing. Likewise, Charles continues to feel subservient to Edmund even after he becomes a member of the Hooper family, suggesting that class consists of something more than just the property one owns or one’s family ties. The significance of property and class in the relationship between Edmund, Charles becomes clearer, perhaps, when Charles asks Edmund why Edmund had locked him in the shed. Edmund sneers and replies, “because I felt like it.” The implication is that Edmund, because of the confidence and sense of superiority that he derives from his class, feels that he can treat Charles however he wants with impunity—and it soon becomes clear that he’s right. By portraying Charles and Edmund’s interactions in this way, the novel suggests that the value of property is not solely monetary. Rather, property is valuable because it allows people to assert their power over others psychologically. Put differently, property gives people a general, intimidating air of superiority and sense of power. In this way, Hill makes a crucial distinction between property—the literal, physical Warings manor—and class—the abstract, psychological advantage that people often enjoy over others as a result of having property. Even when Charles sneaks into the wood surrounding Warings and Edmund follows him, Edmund succeeds in maintaining his position of power over Charles. However, away from home, Edmund becomes noticeably less confident, having left behind the source of his power—his family’s property. In the woods, Edmund can no longer point to Warings as a constant reminder of his superiority to Charles. Conversely, Charles is stronger and more resourceful than Edmund, meaning that he has more literal, physical power. And yet, Edmund continues to hold the same psychological advantage over Charles. Even when Edmund is frightened, weak, and sickly, he can make Charles obey him because he has already done such an effective job of conditioning Charles to fear and respect him. In this way, even when Edmund and Charles wander away from Warings, the dynamics of class follow them. In other words, Edmund knows how to press his class advantage over Charles even when he has lost his property advantage. It is perhaps because Charles feels hopeless that he will ever be seen or treated as Edmund’s equal that he eventually commits suicide. Even after he is given all the same advantages as Edmund—the same house, family, education, and clothes—he can still feel the oppressive weight of Edmund’s class-based sense of superiority pressing down on him. Property is material, while class is psychological—and, Charles ultimately concludes, inescapable. Unable to get out from under Edmund’s thumb, he ends his life. The ThemeTracker below shows where, and to what degree, the theme of Property and Class appears in each chapter of I’m the King of the Castle. Click or tap on any chapter to read its Summary & Analysis. 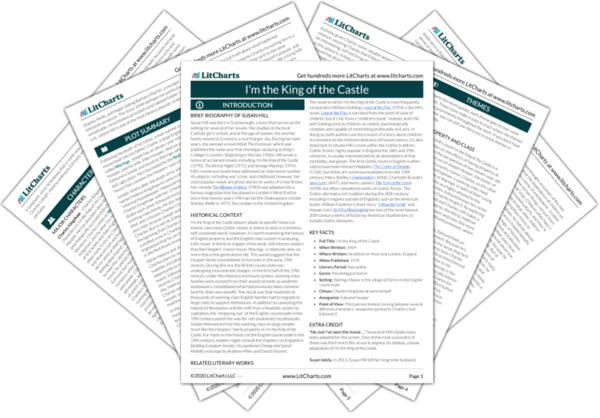 Below you will find the important quotes in I’m the King of the Castle related to the theme of Property and Class. Arn, Jackson. "I’m the King of the Castle Themes: Property and Class." LitCharts. LitCharts LLC, 3 Nov 2017. Web. 17 Apr 2019. Arn, Jackson. "I’m the King of the Castle Themes: Property and Class." LitCharts LLC, November 3, 2017. 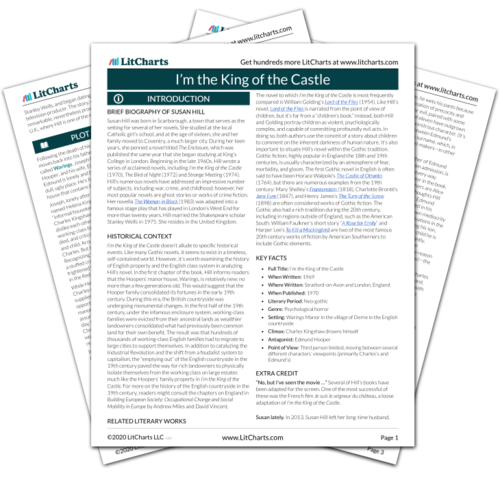 Retrieved April 17, 2019. https://www.litcharts.com/lit/i-m-the-king-of-the-castle/themes/property-and-class.